A distinguished educationist and notable business mogul, HIS ROYAL EMINENCE, Prince, (Dr.) Ramon Adegoke Adedoyin could best be described as a role model worthy of being emulated by many Nigerians. Chief (Dr) Ramon Adegoke Adedoyin is from Giesi (Agbedegbede Ruling House) of Ile-Ife in Osun State (female lineage) Obalufe Royal Ruling House, and Akui Obalaaye Ruling House / Oshinkola male lineage ALL in Ile-Ife, Osun State. Alhaj R.A Adedoyin could also be described as one of the foremost educationists in Nigeria whose singular effort has contributed immensely in providing Nigerians especially the youths with solid education which is indispensable for social and economic empowerment. As an educationalist, he is a great moulder and builder of worthy characters thereby contributing tremendously to the transformation of the society. He radiates the ideals of morality, decency, decorum, God-fearingness, probity, accountability, hardworking and inspiration to management. He is a man of creative ingenuity, great vision, managerial acumen, indefatigable spirit, irrepressible courage whose astute business initiatives have made him a success in every sphere of his life. He learnt the virtues of humility and respect for humanity in his early life at Maha-Had Islamic foundation, Ibadan in 1960. His formal education however started at Ansar-Islam Primary School in Ile-Ife (1961-1969). He attended Oduduwa College Ile-Ife (1970-1974), and Muslim Grammar School, Odinjo, Ibadan (1975-1976). Also he gained admission to the then University of Ife, now Obafemi Awolowo University Ile-Ife (GREAT IFE) and he graduated in 1983 with an honours degree in Mathematics Education. Dr. Adedoyin also had his Masters and Doctorate Degrees in Mathematics and Education from All Saints University of America, New York, USA. Centurion University. Doctor of Education. Adedoyin has earned various Honorary doctorate degrees from many Universities. Local and overseas. His great love for education prompted him to establish the Universal Tutorial College, Ile-Ife as soon as he left the University in the 1980's when all his mates were running after white collars jobs in the corridors of powers. The Polytechnic, Ile-Ife (formerly Universal College of Technology) is today described as one of the fastest growing Tertiary Institutions in the country (Nigeria) offering courses in Accountancy, Business Administration, Computer Science, Electrical/Electronics Engineering, Computer Engineering, Mass Communication, Statistics and Catering and Hotels Management both at the National Diploma and Higher National Diploma levels. A lover of fun and tourism, Dr Adedoyin ventured into the hospitality business when he established the 5-star Hilton hotels, Ile-Ife which today is regarded as one of the best hotels in Osun State (Nigeria).The hotel which is located in the Parakin lay out of Ile- Ife has played host to many great Nigerians who have had course to visit the cradle of the Yorubas. In the field of community development, Chief Adedoyin has made monumental contributions to the development of Ile- Ife community in particular and the society in general. He is a great philanthropist who has been giving scholarship and awards to outstanding students especially those from indigent background. He has made appreciable donations to charity services; he has contributed a lot to the upliftment of the dignity of life and moral values. He is a great defender of humanity, a vanguard of peace, order, justice and equity. It was in recognition of his gallantly that he was conferred with the chieftaincy titles of Balogun of Parakin Eleyele Community, Ile-Ife and Maye of Ife by His Imperial Majesty, Oba Okunade Sijuade, the Ooni of Ife. A town was also named in his honour by the late Ooni of ife covering 9 square miles in new ife city. Maye Town. In recognition of his outstanding and tremendous contributions to community development and the Nigerian project, he was also honoured by the Ife Central Local Government through the naming of the popular NITEL road as Dr. Ramon Adedoyin way. The Ife Development Board also bestowed on him 'The Best Ife Son' Award during an Ife Day celebrations. To his collosal tracks are chains of businesses. Namely. CHANCELLOR :ODUDUWA UNIVERSITY. ILE - IFE. NIGERIA. PRESIDENT : OUR SAVIORS UNIVERSITY OF AMERICA. Delaware, USA. PRESIDENT : UNIQUE CITIZENS (UNIVERSITY) COLLEGE. Accra. GHANA. CHAIRMAN : RAY POWER GUARDS LTD, LAGOS. NIGERIA. PRESIDENT : THE POLYTECHNIC, ILE IFE. EXECUTIVE DIRECTOR: HILTON HOTELS. ILE - IFE. NIGERIA. PRESIDENT : OUR SAVIORS TOURS & VISITORS CO OF AMERICA. New York. USA. PRESIDENT : ODUDUWA POLYTECHNIC, IDIMU, LAGOS. NIGERIA. EXECUTIVE CHAIRMAN : FIRST ACCESS MICROFINANCE BANK LTD. ILE - IFE. etc. 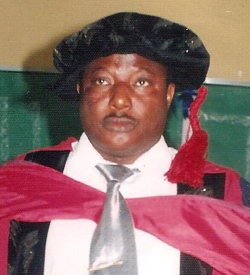 Recently, Dr R A Adedoyin was honoured with a Professorial Chair by Littoral University, Porto - Novo. Benin Republic. Prof R A Adedoyin was also recently honoured by the Governor of Rotary Club as Ambassador of Rotary club. Adedoyin, a justice of peace. Jerusalem pligmage and Alhaj kudus, after several visits to Makkah and jerusalem is married to a devoted wife. Chief Mrs Funmilayo Adedoyin. Yeye Maye of ife and Yeyelua of Maye Town is blessed with good Children. At his leisure, Adedoyin loves dancing, discussing politics,royal stools, playing table tennis among others. He is found praising God almost all the time after every few statements. ChibuzoNnateNwoke, PhD (Denver), Professor of International Economic Relations, is the Vice-Chancellor of Oduduwa University, Ipetumodu, Ile-Ife, Osun State, Nigeria. For several years, Prof. Nwoke was a Research Fellow, and Research Professor, in the renowned Nigerian Institute of International Affairs (NIIA), Lagos, where he was, at different times, Head, Division of International Economic Relations and Director of Research and Studies. At NIIA, Prof. Nwoke was the foremost authority on the political economy of mineral resource endowment in peripheralised capitalist states in the global South. His major intellectual commitment is in interrogating the broad theme of Africaâ€™s development problems, especially from the perspective of the paradox of underdevelopment and poverty in mineral-endowed African economies. He has been a lecturer at Lagos State University; Lead City University; Southwestern University;Oduduwa University; and Visiting Professor, Covenant University. 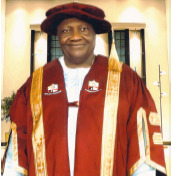 Among the several courses he teaches are: Theories of Development and Underdevelopment; Politics of International Economic Relations; Diplomacy & International Relations; Political Economy; Research Design and Methodology; Foreign Policy Analysis; International Economic Institutions; New States in World Politics; Nigerian Foreign Policy Making and Implementation; Foreign Policies of the Great Powers. Prof. Nwoke has presented several scholarly papers at conferences. He has authored close to seventy publications, including books, monographs, journal articles and chapters in books. Some of his publications are: Third World Minerals & Global Pricing: A New Theory (1987); Critical Perspectives on Nigeriaâ€™s International Economic Relations (2009); Rich Land, Poor People: The Political Economy of Mineral Resource Endowment in a Peripheral Capitalist State (2013); Strategies for Solid Minerals Development in Nigeria (forthcoming). He has supervised several undergraduate, Masters and PhD studentsâ€™ projects; and is external examiner at several Universities. Prof. Nwoke has been a consultant for many organizations, including the European Union; the Economic Community of West African States; the United Nations Centre for Transnational Corporations; the United Nations Conference on Trade and Development; the Nigerian Institute of International Affairs. He is the Secretary-General of the Nigerian Society of International Affairs; Editor-in-Chief, Oduduwa University Journal of Management & Social Sciences; and Guest-Editor, African Journal of International Affairs and Development.